Alchemy was the talk of the town in 15th century Europe. The who’s who of the scientific fraternity was hunched over tables trying to create gold and silver using science and sorcery. But their attempts landed them nowhere near the material that kicked off a revolution some hundreds of years later. It was polymer, a material that is durable, pliable, light and relatively inert. The first synthetic polymer, or plastic as we know it, was created in the early 20th century. Since then, contemporary alchemists have been cutting up and repurposing hydrocarbon molecules into thousands of materials that make up the plastics family. Everything from bottles to money is now plastic. But the magic material has a flipside—plastics do not decompose naturally. Its pervasive dominance means that it is now embedded in, quite literally, every habitat in the world—even in the most isolated eco-system. One example is the Great Pacific Garbage Patch—a 600-sq-km floating island of plastic waste in the North Pacific Ocean. Less spoken about are the hundreds of thousands of landfills, drains and rivers choked with plastic waste, especially in the developing world. Lately, another worrying aspect of plastics has been gaining attention—minute particulate plastics, or micro-plastics. When exposed to ultra-violet solar rays, water and salts, plastic can deteriorate and fragment into miniscule particles. They can be ingested by simple life forms and enter the food chain. Such microplastics are also manufactured to be used in several consumer products. With the alarm over the unmitigated rise of plastics reaching a fever pitch, the theme for the World Environment Day-2018, held every year on June 5, is plastic pollution. Earlier this year, while signing the agreement to host the UN-led World Environment Day, India’s Environment Minister Harsh Vardhan declared: “It is the beginning of the end of plastic menace.” But a look at India’s own track record when it comes to managing plastic raises doubts about the proclamation. According to a September 2017 report by the Central Pollution Control Board (CPCB), which extrapolated data from 60 major cities, the country generates around 25,940 tonnes of plastic waste a day. About 94 per cent of this comprises thermoplastic, such as PET (polyethylene terephthalate) and PVC (polyvinyl chloride), which is recyclable. The remaining belongs to thermoset and other categories of plastics, such as sheet molding compound (SMC), fibre reinforced plastic (FRP) and multi-layer thermocol, which are non-recyclable. According to the latest report on the Implementation of Plastic Waste Management Rules published in 2016, the plastic waste generated across the country (barring six states where data was not available) is close to 1.6 million tonnes a year, with almost half of it coming from Maharashtra and Gujarat. However, the volume of plastic waste generated seems suspiciously low when compared with the data of Plastindia Foundation—a body of major associations, organisations and institutions connected with plastics. The Foundation estimates that in 2017-18 alone, India consumed 16.5 million tonnes of plastic. Worse, according to industry body FICCI, 43 per cent of India’s plastics are used in packaging and are single-use plastic. 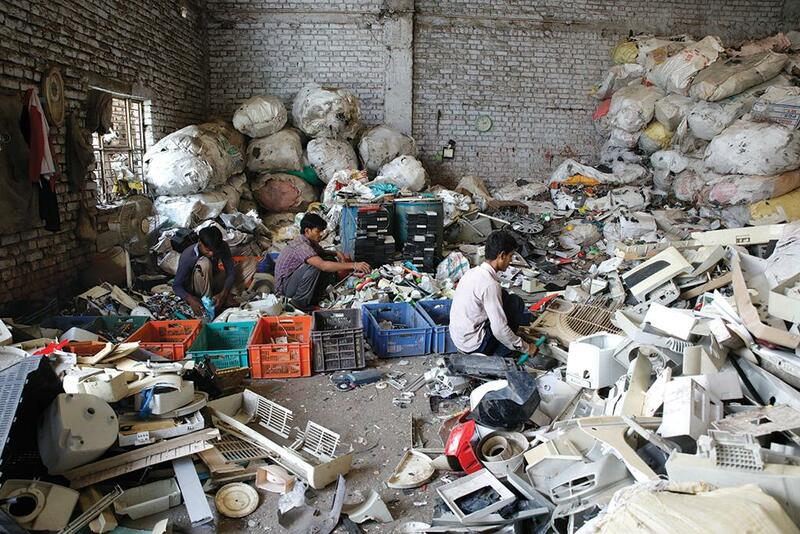 Consumption has clearly outstripped India’s capacity to recycle. “India recycles much more plastic than the global north through a robust system of waste collectors and segregators. But a lot of recycling here can more appropriately be called downcycling or repurposing,” says Pratibha Sharma, regional coordinator at Global Alliance for Incinerator Alternatives (GAIA). However, this also depends on profitability. Waste collectors realise that single-use plastics are not useful in the market in terms of their economic value. So in the end a lot of cost is externalised either onto waste collectors or to the environment and this needs to be addressed, she adds. 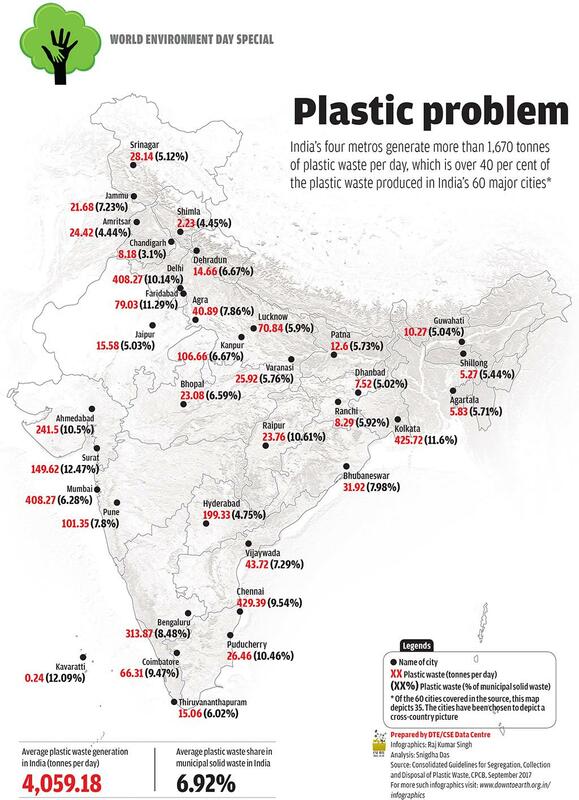 While an estimate by FICCI puts the number of recycling units in the country at 7,500, more than half of which are unorganised units, the non-profitability of single use plastics means that much of India’s discarded plastics end up in landfills and drains and rivers that ultimately flow into the sea. A recent study shows over 90 per cent of the total plastics that end up in the ocean comes from rivers in Asia and China. It identifies the Ganga and Indus as the major sources in South Asia. Over the past two decades, 25 of the 29 states and several Union Territories have tried to regulate the use of plastics. India’s first attempt at tackling the menace of plastic waste came in 2011 when the government notified the Plastic Waste (Management and Handling) Rules, 2011. The policy sought to disincentivise the use of poly bags by setting up a pricing mechanism for them and also to establish rules for recycling by local authorities. The Rules were replaced with a stronger Plastic Waste Management Rules, 2016. The new rules gave emphasis on a complete ban on plastics below 50 microns, phasing out use of multi-layered packaging and introducing extended producer responsibility (EPR) for producers, importers and brand owners to ensure environmentally sound management of plastic products until the end of their lives. But while the implementation of the rules were poor and still being figured out, the government came up with an amendment to the rules earlier this year which has gone quite a way in diluting the effect of the 2016 rules. For one, the rule on explicit pricing of carry bags which required vendors to register and pay an annual fee to urban local bodies was removed. The complete ban on “non-recyclable multilayered plastic” which was implied in the 2016 rules was removed through some clever word play. The term “non-recyclable multilayered plastic if any” has been substituted by “multi-layered plastic which is non-recyclable or non-energy recoverable or with no alternate use” giving producers an escape route by claiming that products can be put to some other use, if not recycled. This type of plastic was supposed to be banned by March 2018, but it is nowhere near a phase-out. While the government has claimed several times that it wants to shut down all small and illegal plastic producing plants, the amendment to the rules seems to dilute this as well. Waste-to-energy (WTE) plants that incine rate municipal waste to produce energy have been hailed as a solution to the gargantuan problem. Apart from several state and city-level governments, the Centre also plans to invest in 100 such plants by 2020. But such plants would contribute to air pollution, besides derailing plastic waste management efforts. Since India’s waste has high organic content, its calorific value is typically lower than what is required to run WTE plants. In other words, to make WTE plants effective, plastic content with higher calorific values has to be increased in the municipal waste. Is this what we are looking forward to? The other solution is to promote substitute for polythene bags. Over the past 15 years, bioplastics have been promoted as potential alternatives. They are classified as oxi-biodegradable plastics, hydro-biodegra dable plastics and just biodegradable plastics. Though argued as better than conv entional polybags in terms of decompo sability, biodegradability of these bags are yet to be proven. Researchers question the actual extent of decomposition of such plastics in land-fill conditions and their implications on food security since edible starch and vegetable oil are used to create some kinds of biodegradable bags. The biggest indicator of the lack of success is perhaps reflected in the usage of bioplastics which is estimated to be just 2 per cent of the total. Another area of research that has provoked excitement is the discovery of plastic-eating bacteria but what is lost out in announcing such discoveries is often just as critical as what is retained. Another avenue that is increasingly being presented as a solution to the plastic waste problem is substitution of plastic with other biodegradable materials such as reused cotton or paper. The idea has been appropriated by several start ups that are producing common everyday items such as poly bags and utensils from substitute materials ranging from the conventional cloth, glass, wood and paper to newer novel materials produced from vegetable fibres and cellulose. But while replacement might seem like a plausible path to cutting down on plastic, especially the disposable kinds, the efficacy of the operation is still not completely proven. The per capita consumption in India is still low compared to more developed countries. According FICCI, Indians consume 11 kg of plastic per year in comparison to 109 kg by an average American. But this figure is estimated to rise in the coming years. To avert a crisis would require vision, political will and the nerve to pull off a balancing act. The solution to India’s problems with plastic waste can be addressed through targeted investments in recycling and ensuring sustained effort to cut down consumption.